So back before we had kids I owned Descent 1st edition. My wife and I played it several times and both liked it quite a bit but the play time was oppressive to say the least. As I recall, with setup and putup we were clocking in around 6 hours or so per session. After kids came along I did some cleanup and sold off some games. I knew Descent would never hit the table again (and what a shelf hog!) so away it went. Today while looking for some boardgames to play on iPad I discovered this Road to Legend app for Descent 2nd. I don't know much about it but apparently it allows for Descent play with no Overlord and I'm intrigued. I'd also heard in the past the 2nd edition plays considerably faster than 1st. Put the two together and it has me considering buying Descent 2nd for the family to play. But I have some questions. 1. So is Descent 2nd wrapping up its lifespan? Looks like its been out for a while and there's a swath of expansions but I can't get a feel on whether its still kicking or not. 2. Does the Road to Legend app allow for cooperative play of the base game quests or just the ones in the app? I suspect we'll not get to use any of the base game adventures in case of the latter, which would be a bummer. 3. So what is the play time these days for a session of Descent? 4. Is there anything that has come along in the boardgame world lately that would be a better alternative to getting into for exclusive cooperative play (no Overlord/GM player)that's similar to Descent, i.e. quests, monsters, combat, treasure, campaign play? 3. Depends on the mode, I can only vouch for RtL, I'd say 2 hour per session is fair game. 4. Yup, its called Gloomhaven and its pure co-op with character personal goals, it's hitting retail this month or two. The content is worth the price tag and the shelf space. Thanks Allan! Man, Gloomhaven is a beast. I'm reading about it now. Looks very good but maybe too complex for us. If I were choosing one for me and my old gaming buddies it would be top of the list probably but I'm hesitant to try it with the fam. That's a big price tag to take a chance on. How do you feel the complexity compares to Descent? 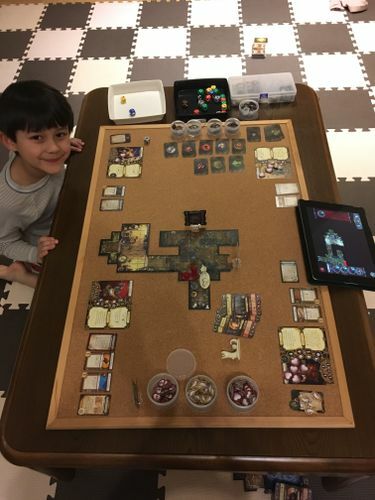 I can’t speak on Gloomhaven, but as for Descent, I’ve just recently gotten into it in the last 6 months and am playing with my son who is nearly 6 yrs old. Most of our quests are 2-3 hours. We are both enjoying it quite a bit with the RtL app. He’s playing a Runemaster (mage) and I’m playing a Shadow Walker (scout) and a Bard (healer). It’s great fun, my son thinks the figures are cool, it gives him tons of practice with addition and subtraction (I make him calculate all the die rolls and figure out how much life remains on baddies) and it’s easy to save a game in progress. The app saves much of the game state, and I just take a few cell phone pics of the board state and character sheets and we’re set. Hey that's awesome Nathyr! I'll be playing with my wife, our 9 yo daughter and our 5yo son. The 9yo will be able to engage with the rules but I'm thinking the 5yo will mostly just like playing with the miniatures and rolling dice. That's why I'm looking at Gloomhaven reviews and thinking it may be a bit much. As I'm sure I'll be doing all of the rules lifting for us and helping with turn taking Descent is looking more manageable. Gloomhaven seems to have quite a bit more going on for each player each round which would make for a far busier game for me (and a more boring one for the 5yo). I am playing a lot of Decent 2nd Edition Road to Legend with my 6 yo. We enjoy it a lot. There is quite a bit of content available and we love how the app draws from our collection to add a bit of variety. Playtime can vary, but a session is easy to pause and then get back into again. We usually play for an hour at a time. As for the lifespan, there haven't been a lot new expansions lately, but on the FFG website they list a number of reprints, so I assume the game is not dead yet. Good to hear CM, I’m glad to hear you folk are successfully playing with the little ones. And very glad to hear you’ve found “pausing” the game to be easy to do. I’m thinking an hour or so will be our play limit as well. Since most folks using RtL at this point are probably utilizing numerous expansions (like you CM), I’m wondering if it’s still as enjoyable if you’re only using the base game? He didn’t specifcally say but maybe Nathyr is using base only since they’re pretty new to the game too. Can you comment on that Nathyr? Anyone else? Base game is great on it’s own and unlocks what you need to play both the tutorial and first full campaign on the app. I did add Shadows of Nerekhall and Labyrinth Of Ruin to my collection. Mainly because those were the two big box expansions (adding the most content for the money), SoN unlocks a second full campaign in the app, and I wanted to have them just in case they became scarce later without my realizing it. I also wanted to have the wider variety of monsters, heroes, and classes for when I play with my adult guys game group. Also, when you tell the app what you have, it incorporates those monsters, status effects, heroes, items, and side quests into your games. So it definitely adds variety to your games. In my current game with my son, I’m playing two heroes from expansions. But I could just as easily picked two heroes from the base set. My recommendation is start with the base set and play the tutorial campaign. If you are digging it, pick up SoN. Then you’ll have a wider variety of stuff to pull from for your full campaign. The app can tell you exactly what any given expansion adds to the app, if you are curious. Great to know, Nathyr. Thanks for the extra input!